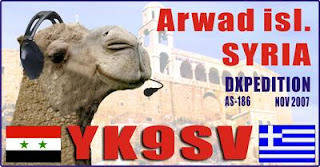 A group of members of RAAG organises a DXPEDITION to SYRIA, to AWARD island (AS-186) with the call YK9SV. The operators are: SV1IW - SV1JG - SV1QN - SV1RC - SV1RP - SV1GE - SV1ACK - SV1GYG - SV8CS. 3B7C : A contest like running.!! DXpedition.